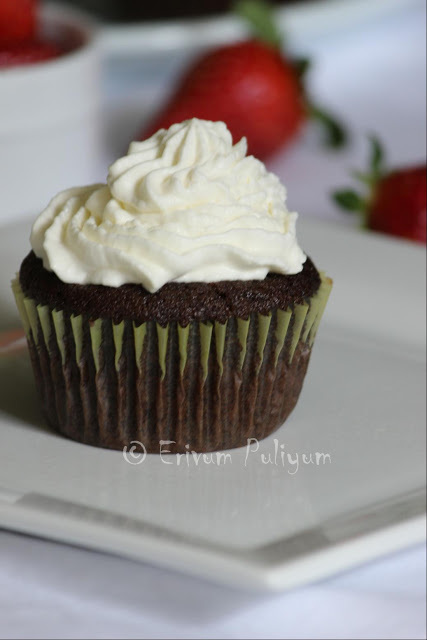 Erivum Puliyum: Chocolate Sponge Cake(Swiss) Rolls & EP's 300th Post !!!! Chocolate Sponge Cake(Swiss) Rolls & EP's 300th Post !!!! Coming back to today's recipe,I have celebrated all my happy moments with a sweet and so do this post too.Chocolate swiss rolls or chocolate sponge cake rolls,always admired and liked from bakeries or stores.I happened to try these at home and was a successful one.I had earlier tried the Sponge cake rolls sometime back but this was a long awaited demand from my kids and so am very happy that I could make them their favorite swiss rolls.And the biggest surprising part in these rolls is that this doesn't have any flour in it and no baking powder or soda,only eggs.Though the looks seem to be complicated but the recipe is a simple one which anyone could give a try !! -In the meantime, melt the semisweet chocolate chips using double boiler method or microwave. (I microwaved it for 45 secs on high).Leave aside to cool slightly. 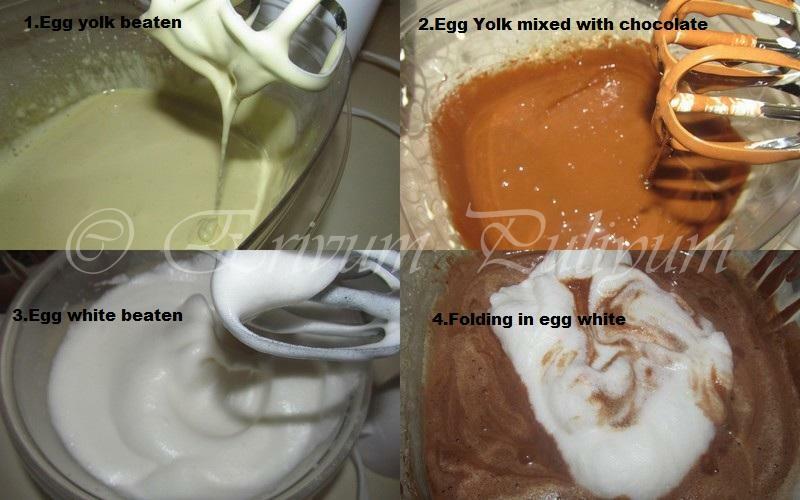 -Add in the vanilla extract and the melted chocolate.Beat just to combine and leave aside. -In another clean bowl,whisk the egg white until foamy.Beat at medium high speed until soft peak forms.Then,add the remaining 2tbsp of sugar and beat again until stiff peaks. -Spread the batter in the prepared pan and with the help of spatula or back of a spoon spread until the corners. -Remove from oven and place on wire rack to cool. -Cover it with a clean slightly damp kitchen towel. -In the mean time,in a separate bowl whisk the whipped cream until soft peaks.Then add the vanilla extract & sugar,whisk again until stiff peaks. -Once the cake is cooled completely,spread the whipped cream and gently roll the cake,peeling the parchment paper as you roll. -Place in the refrigerator for half an hour to set.Then cut in pieces and serve with a cherry on each slice!!! 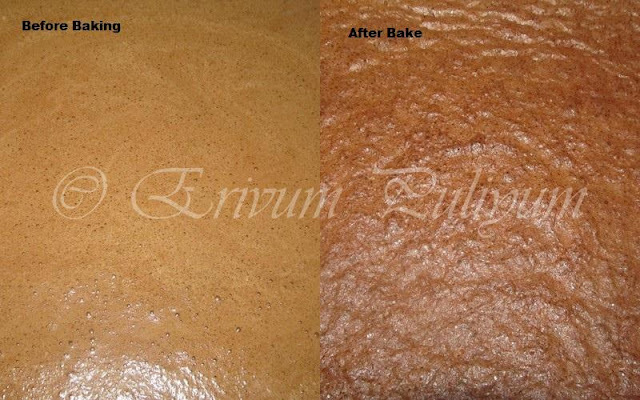 * The buttering of tray and the parchment paper is done for easy removal of the sponge cake. * The whisked egg yolk mixture should fall back in slow ribbons once you raise the beater. * You can also add flavor to the plain whipped cream by using any fruit preserve. wow !! looking very tempting and nice dressing of cherry. Swiss rolls looks delicious.. Love it..
Congrats on the 300th post. Congratulations on your great milestone....Wow-300 posts, good job. love the beautiful choco=swiss rolls!! Congrats Julie! Wish U Many More Hits in future....This Chocolate Sponge cake Swiss roll looks so delicious n tempting, real treat for the occasion...Great Work dear! 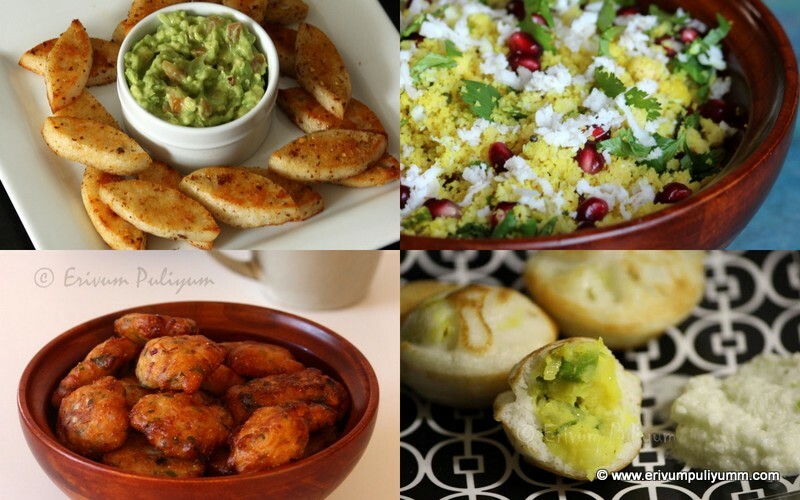 Thanks for this great recipe with detailed pictures n explanation..will try it sometime!! You are going very fast, My friend! 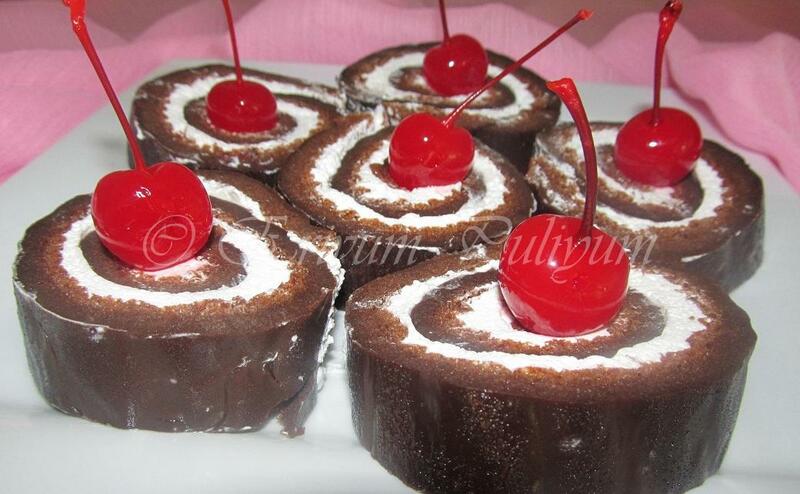 Swiss rolls are my favorite cakes that I made in my home. Yours look lovely. Looks yum yum. nice step by step explanation and congrats on your 300th post. just mind-bowing cake.. congrats dear on your milestone..
Wow.....can't believe on my eyes. So perfection in swiss cake roll. Irresistible one, excellent!!! looks so perfect!! awesome julie!! Perfectly made swiss rolls.Yaa,your chocolate seems real dark which gives it kind of exotic pattern..Yummy.And hugs on your 300th post ! Cheers ! Congrats Julie. These rolls looks super duper delicious. congratulations on ur 300th post!!!! 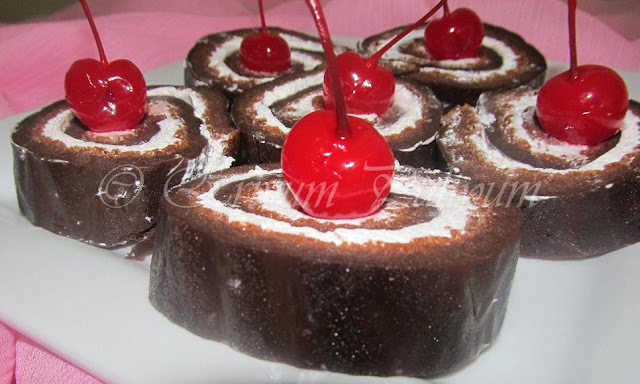 this cake roll is mouth-watering... and i want to try it.... whenever i made swiss roll, the cake broke when i tried to roll it and it was a disaster... i'll try ur method of using a damp cloth to cover the baked cake. Can see the real talent!! Very well made!! Impressive..
Julie congrats on the 300th Post may you post 1000 and 1000nds of recipes. The cake looks amazing. wow swiss roll came out perfect....i wanted to try this recipe for long but always a bit apprehensive....now wil try it very soon !!! Congartualtions on your 300 posts! what a nice idea for serving this cake! 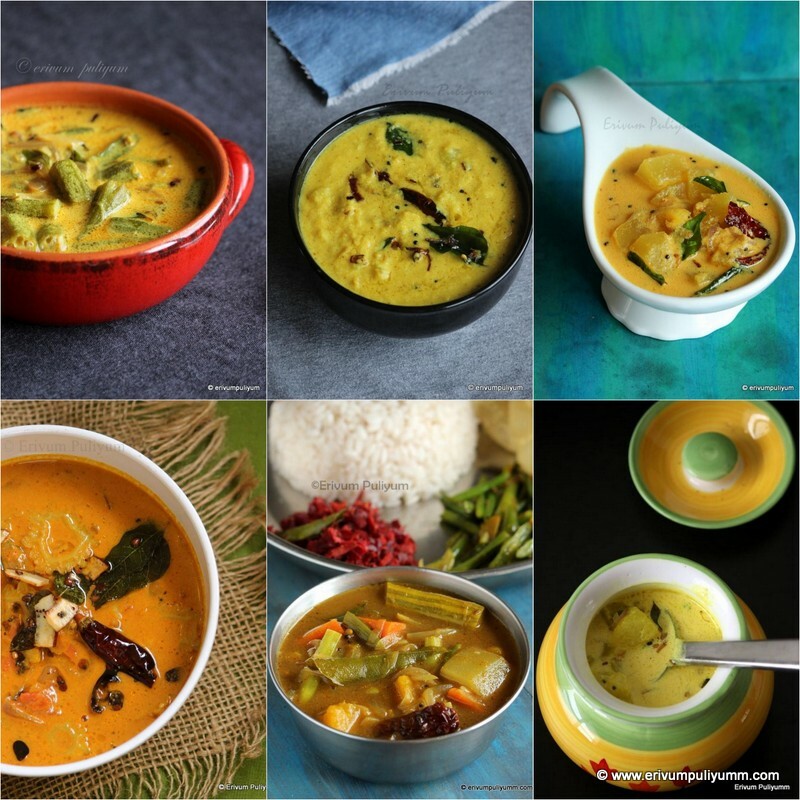 Congrats on reaching the 300 mark Julie...Hoping to see many more wonderful recipes from you..
this is fanatabulous.... oru titani odum ente vaayel!!! congratulations... its a great achievement!!! cakes are too yummy and tempting!!! Congrats Julie for your 300th post..Yummy,nice treat for kids.. Brilliant! you seem to be on a roll! :). Looks sssoooo yummy and pretty! way to go! rolls look awesome Julie.wish I could have a slice. Congratulations! That's a great milestone! The swiss/cake rolls looks utterly delicious! congratulations for the milestone dear... the cake is super tempting, super duper gorgeous..
Congrats on ur 300th post Julie, keep on going gal. Thise rolls looks super elegant,pretty addictive. Congrats on your 300th post, wishing many more posts. This chocolate swirl cake looks awesome perfect. 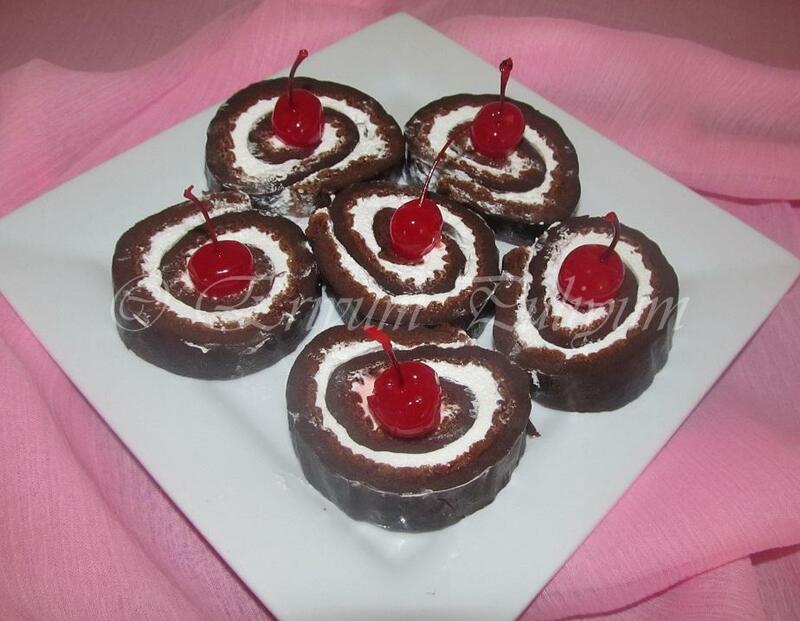 congrats for crossing 300 posts..swiss rolls look delicious and yummy! This is such a great way to celebrate the 300th post Julie! Congrats! Congrats Julie. These look professionally made. I am bookmarking these.